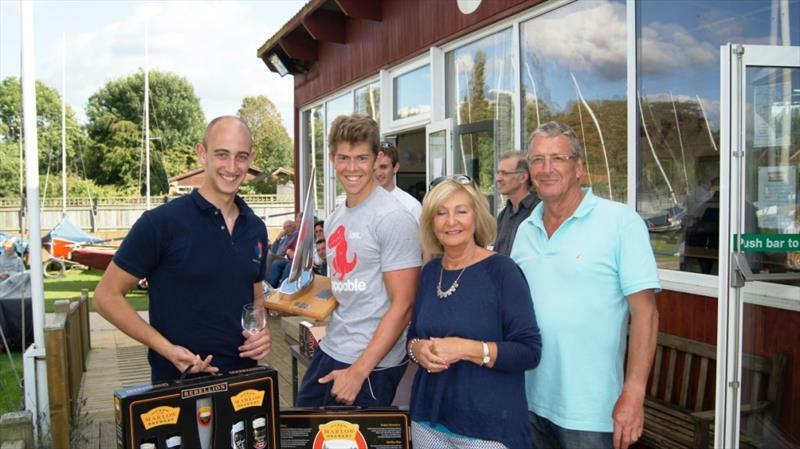 Upper Thames Sailing Club held its annual Merlin Rocket Open Meeting on the 15th and 16th September. This year the event was blessed by both sun and a decent breeze from the South West, shifty without being horrible. The sunny weather brought out a large number of other river users, both motorised and oar propelled and the fleet (with varying degrees of success) navigated around them. On the Saturday, the event was for the De May Vintage series and ten boats turned out for the first two races, both of which were won by Martin Hunter and Margaretha van Dam on the water and on handicap in their Martine design, Quiver. 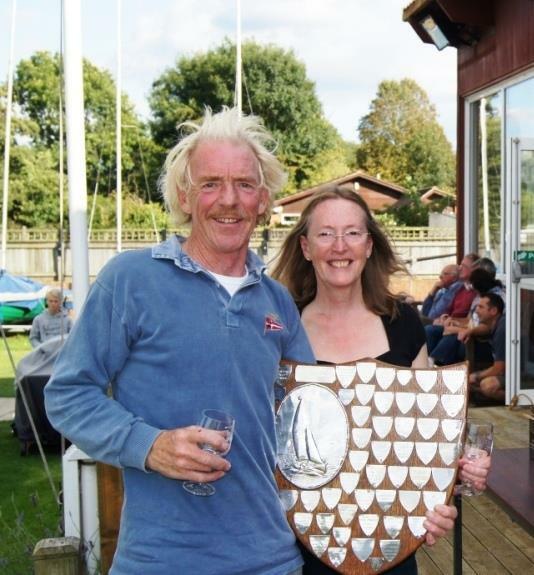 Pat and Jilly Blake were second in both categories, sailing their Jack Holt Nellie design, Tiercel and John and Dan Meadowcroft were third, sailing Lady Luck, a Proctor XII. The third race was for the Spade Oak Bowl and this was opened up to all Merlins, wide and narrow and fourteen boats took to the water. For a time, conditions were perfect but then the wind faltered and the final leg was completed in the lightest winds of the day. 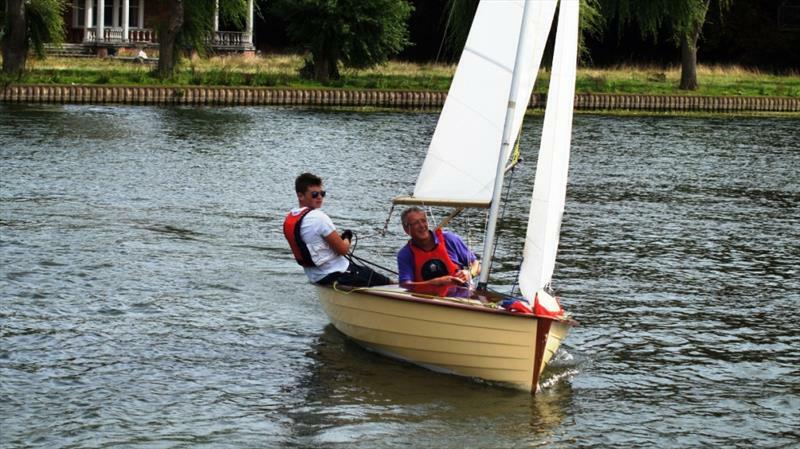 On Sunday morning, joined by a further three boats from Lymington, Hampton and an Upper Thames/Hampton entry, racing took place for the Allen Challenge Cup which was three races for the Thames Series. The wind had moved round more to the South and was quite lumpy at times which surprised a few and resulted in the occasional fill up and capsize. John and Deirdre Bell sailing the Proctor XII Grand Teton, won overall with a first, second and third with Alex Jones and Jack Deung of Cookham second in their plastic Tales (two seconds and a third) and Stuart Jenkins and Nicola Scadden third with a first and two sixths (Passing Cloud design). Martin Evan and Mandy Platts in an NSMI rounded up the prize winners with a third, fourth and an eighth. All in all a great weekend and we look forward to seeing everyone again next year.